Nassau, Bahamas - On October 25, 2013 the 2013 Bahamas Home and Builders Show & Energy Expo, co-sponsored by the Bahamas Chamber of Commerce and Employers’ Confederation, will begin a three-day expo, with the first day dedicated to “The Green Economy” at the Wyndham Nassau Resort (Baha Mar). Nassau, Bahamas - When the doors open to the annual BCCEC Gala event at the Imperial Ball Room, Atlantis on November 9th at 7PM, all the past Chairmen over the last 40 years will be honoured. Included in the list is Sir Roland Symonette, the first Premier of the Bahamas who was knighted by Queen Elizabeth II in 1959 and the Minister of State for Investments in the Office of the Prime Minister, Hon. Khaalis Rolle. But the greatest honour of the night will belong to businessman William "Billy" Lowe, owner of Lowe's Pharmacy, who will be the recipient of the Lifetime Achievement Award. 17th October: Excel Formulas & Function facilitated by Keshelle Kerr. 24th October: Microsoft PowerPoint: Smart Shortcuts & Expert Secrets facilitated by Keshelle Kerr. Nassau, Bahamas - The Bahamas Chamber of Commerce and Employers Confederation is pleased to announce the appointment of Ms. Keshelle Kerr as its new Executive Director of the Chamber Institute – the education arm of its organization. Keshelle founded and led The Training Authority, an independent corporate training company where she established herself as an expert in the area of productivity, Microsoft Office and business skills training. 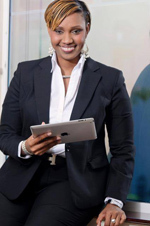 She has also cemented her name as the go to speaker and advocate in financial literacy, wealth creation and entrepreneurship education amongst youth and women through her current activities as founder and president of Creative Wealth Bahamas. 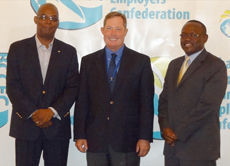 Nassau, Bahamas - Declaring "small business is the lifeblood of the economy," Bahamas Chamber of Commerce and Employers Confederation Chairman I. Chester Cooper today launched the Chamber's long-anticipated mentorship program designed to give small to medium size businesses the boost and help they need to overcome staggering odds and succeed. "For over 200 years, the Bahamas Chamber of Commerce has played a leading role within the private sector as a promoter and protector of commerce," said Cooper. 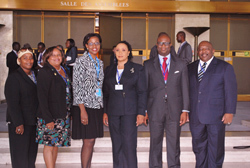 "Our development of the small business mentorship and training program has been guided by this centuries' long..."
The Bahamas Chamber of Commerce and Employers Confederation (BCCEC) was recently represented among the 5,000 delegates from around the world that flocked to the International Labour Conference in Geneva, Switzerland this month to adopt and oversee compliance with international labour standards and discuss important issues of concern to the world of work. Job provision for growing and aging populations, sustainable development, social dialogue and recession recovery are a few of the topics addressed during the 102nd session hosted by the International Labour Organization (ILO). 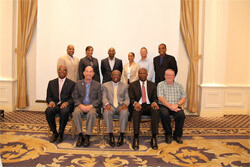 Nassau, Bahamas - Please be advised that the Annual General Meeting & Election of Officers and Directors for the Chamber’s 2013-2014 Administrative Year is scheduled for Thursday 16th May, 2013 at 11:30 am at The British Colonial Hilton. Immediately following the AGM we will have our Meet the Minister luncheon with The Honorable Ryan Pinder, Minister for Financial services. 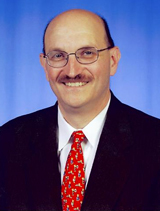 Mr. Pinder will address the Government’s initiatives in Financial Services as well as arbitration and dispute resolution. 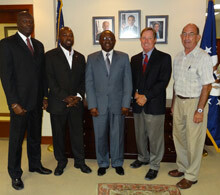 Nassau, Bahamas - On Tuesday, March 19, the new Chairman of the Bahamas Chamber of Commerce and Employers Confederation (BCCEC) I. Chester Cooper and the Board of Directors visited the U.S. Embassy to meet with Acting Deputy Chief of Mission Alex Sokoloff and other Embassy officials to share the priorities and concerns of The Bahamas private sector. We live in a time of great challenge for this community …….. It is a time that demands vision and incisive action if we are to change, fundamentally, for the better, the economic fortunes of Freeport and greater Grand Bahama Island. 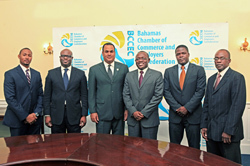 The Bahamas Chamber of Commerce and Employers Confederation, "BCCEC" elected a new executive board at their recent Annual General Meeting. The new board consists of prominent businessman, I. Chester Cooper, President & CEO of BAF Financial as Chairman; Robert Meyers of V Trade supply as Vice Chairman; Peter Goudie of PGHJR Consulting, Secretary and Hubert Edwards of the Bank of Bahamas as Treasurer. Mr. Winston Rolle will remain on in the capacity of Chief Executive Officer. Nassau, Bahamas - The Bahamas Chamber of Commerce and Employers’ Confederation, in conjunction with the Embassy of the Republic of Haiti in the Bahamas will be holding an information session on Business and Investment Opportunities in Haiti. As the redevelopment of Haiti continues, there is a need for expertise in a number of areas which provides business opportunities for enterprising businessmen. Nassau, Bahamas - Business Leader are invited to attend! There are a number of incentives for business that are not readily accessed by the local business community. 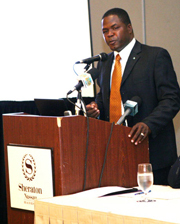 In an effort to create more awareness of the various business incentives, the Bahamas Investment Authority and Office of the Prime Minister, in conjunction with the Bahamas Chamber of Commerce and Employers’ Confederation, is putting on a presentation to members of the business community and general public to discuss the benefits available under the City of Nassau Revitalization Act and Hotels Encouragement Act. 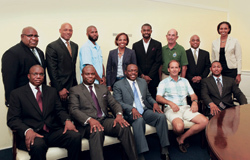 NASSAU, The Bahamas -- Khaalis Rolle, Minister of State for Investments in the Office of the Prime Minister, said the only way for the country to generate enough activity to employ 43,000 persons is to allow small and medium sized businesses to have access to capital and to give them technical support. Mr Rolle was speaking at an International Trade and Financing Seminar co-sponsored by the U. S. Embassy, The Bahamas Chamber of Commerce and Employers Confederation (BCCEC) and the Grand Bahama Chamber of Commerce. 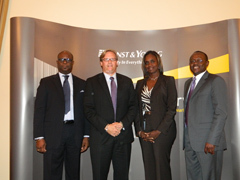 It was held at the Sheraton Nassau Resort, Tuesday, May 22. The United States Embassy’s Chargé d’Affaires John Dinkelman will be a featured speaker at the Nassau event on May 22 and Freeport the event on May 24.